For superb Non-EU/EEA students enrolling in a Leiden College grasp's degree programme and for excellent students from all nationalities enrolling in a Grasp of Regulation Complex Programme or MSc in International Relations and Diplomacy. 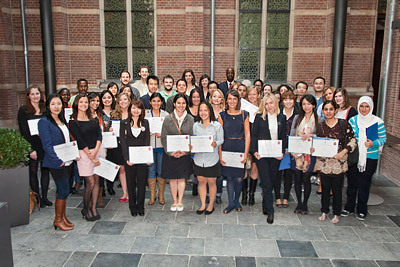 Non-EU/EEA students enrolling in a Leiden College master's level programme starting September 2013 or February 2014 ( All MA, MSc and LL.M programmes as discussed on the site Grasp's programmes in Leiden, various systems have a start date in September most effective). The number and type of award of the scholarship depends on the budget available for each Faculty department. The type of award has no reflection on the students' academic level of excellence. Application procedure for September 2013 / February 2014 intake (the application for September 2013 for all Faculties except LAW is closed). Deadline 1 February 2013 for programmes (except LAW) starting in September 2013. This application round is closed. Deadline 1 April 2013 only forprogrammes of the Leiden Law Schoolstarting in September 2013. 2A All LExS applicants will be informed by the scholarship department of Student Educational Affairs. To apply for the scholarship, you should write a letter of motivation (in Word) of a maximum of 500 words, in which you indicate why you believe you should be considered for this scholarship. The Word document should then be attached on thescholarship page in your online application for the master's programmes for which you are applying.